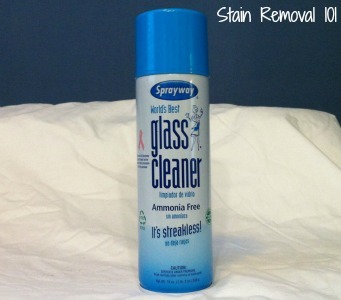 I've been using Sprayway glass cleaner, the ammonia free version, for a while now to clean my mirrors, glass windows, and even my car windshields. This brands bills itself as the "world's best glass cleaner" and while I can't speak to that, never having tried every single one for comparison, I have really liked how this product works. I first learned about it from my father, who has apparently been using it for years to clean windshields, both inside and out, in our family cars. I recently saw a can in his garage and asked him about it, and he sang its praises for a whole minute (a long time to discuss window cleaner, surely.) That convinced me I needed to try it to share my results on the site. It is an aerosol spray (but has no CFCs), and that is unusual for me to use since I tend to use the trigger spray varieties. However, I quickly appreciated the aerosol spray since it really covers the surface I want to clean more easily, with a light foam that stays put, unlike the trigger sprays that drip down the glass in some areas without getting other areas even wet. I've used this product on really gross bathroom mirrors that have lots of toothpaste residue and other yucky gunk (since it is in our kids' bathroom) and it cleans the mirror like a charm. All I have to do is spray and wipe. No scrubbing or using my fingernail to get up the gunk. The packaging says that it is streak free and I have found this to be true too, which is a nice bonus. It has a light fragrance, but nothing that bothered me and the scent dissipates quickly. Has anyone else used this product for cleaning their windows or other glass items in their home? If so, I'd love to hear what you thought about it as well, good or bad. You can share your glass cleaner review here, or read others that have already been submitted. I love Sprayway! It's the only glass cleaner I will use. Join in and write your own page! It's easy to do. How? Simply click here to return to window cleaner.